Lying some 900 km south of Cairo, Aswan has long been known as the “Gateway to Africa” and the contact point between Arabian North Africa and the sub-Saharan cultures. In ancient times it was called Syene by the Greeks, which they took from the Egyptian word “swenet” meaning “trade”. It is also sometimes known as Egypt’s winter resort, offering a delightful, natural beauty with a relaxed and pleasant atmosphere and a warm and dry climate. A wide variety of ancient monuments and its peaceful beauty draw visitors to Aswan throughout the year, but especially in the winter months. At Aswan the Nile Valley narrows to two thin strips of green flanked by stony desert. The river is serene at this point and its waters are dotted with feluccas carrying visitors around the eroded stones of Elephantine Island in the centre of the river. 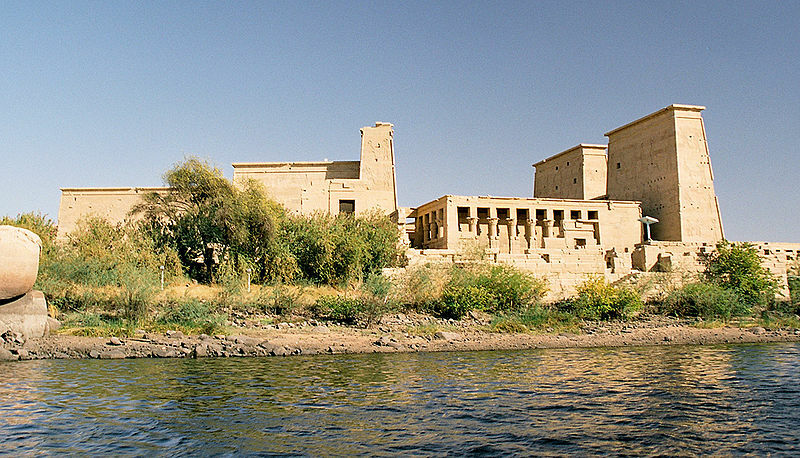 Aswan is the smallest of the three major tourist cities on the Nile. 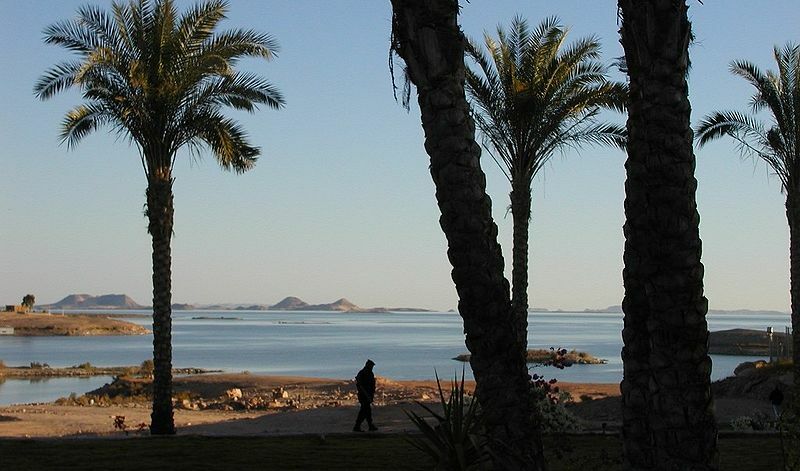 Being the furthest south of the three, it has a large population of Nubian people, mostly resettled from their homeland in the area flooded by Lake Nasser. Aswan is the home of many granite quarries from which most of the obelisks seen in Egypt were sourced. 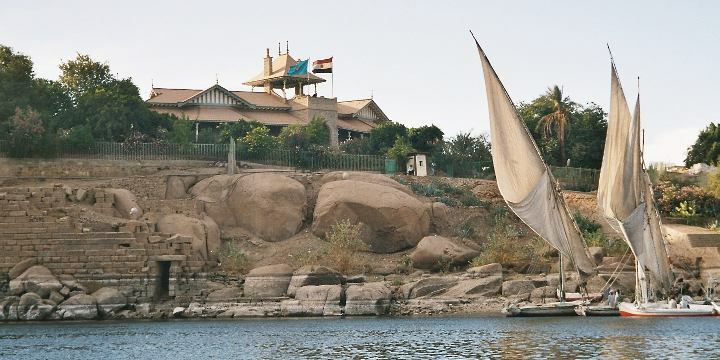 Most likely you will ride a felucca in Aswan simply getting to some of the other wonderful sites and museums. But if, for some reason you don’t, you must take a sail in a felucca in Aswan, perhaps around Elephantine or Kitchener Islands. Feluccas are the traditional sailing boats of the Nile and their ancient form still graces the river as it has done since the time of the pharaohs. Two hours of felucca trip will cost you between 35-70 LE depending on your negotiation skills. Elephantine was the largest trading centre in Nubia and an important religious centre that worshipped the goddess Satet, her consort Khnum and their daughter Anuket. The island lies at the foot of the first cataract and is the main one of many islands that dot the Nile at Aswan. A number of Old Kingdom towns were here, the oldest of which, Yebu, was the country’s first frontier city. On the south of the island stood the Temple of Khnum, built by a line of pharaohs from Tuthmosis II to the Ptolemaic kings. All that remains now are a few ruins. Aswan Nilometer. This nilometer design comprises a flight of stairs leading down into the water, with depth markings along the walls. 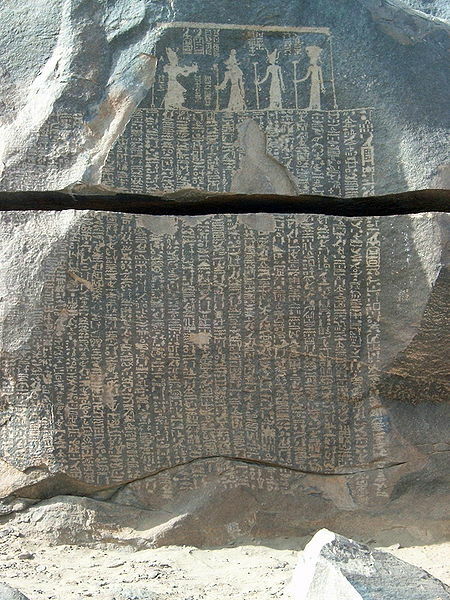 The best known example of this kind can be seen on the island of Elephantine in Aswan. This location was also particularly important, since for much of Egyptian history, Elephantine marked Egypt's southern border and was therefore the first place where the onset of the annual flood was detected. Beside it is a Nilometer which was of enormous importance in ancient times. This stands close to the museum and was used to measure the varying levels of the Nile in order to predict the extent of the flood. The Nilometer is in a perfect state of preservation, having been rebuilt during the late Ptolemaic and Roman periods. Further south lays the remains of a second, more ancient Nilometer, associated with the great temple of Khnum. Ruins of the temple of Khnum, on the southern point of the island of Elephantine. Only the imprint on the ground remains quite visible. Some elements of the temple were re-installed. Also on the south end of the island is a small temple from the reign of the Meroitic king Hergamenes II (218 – 196 BC), originally built at Kalabsha, and which was reconstructed on the southern tip of the island in 1972; the gateway of the Temple of Ajuala (a locality near Kalabsha) was constructed nearby in 1988. Not far away is the granite statue of an elephant that was found in 1987 during the excavation of the temple of Isis in Aswan. Aswan Museum. Elephantine island has the Aswan Museum at the southern end of the island. Ongoing excavations by the German Archaeological Institute at the island's ancient town site have uncovered many findings that are now on display in the museum, including a mummified ram of Khnum. 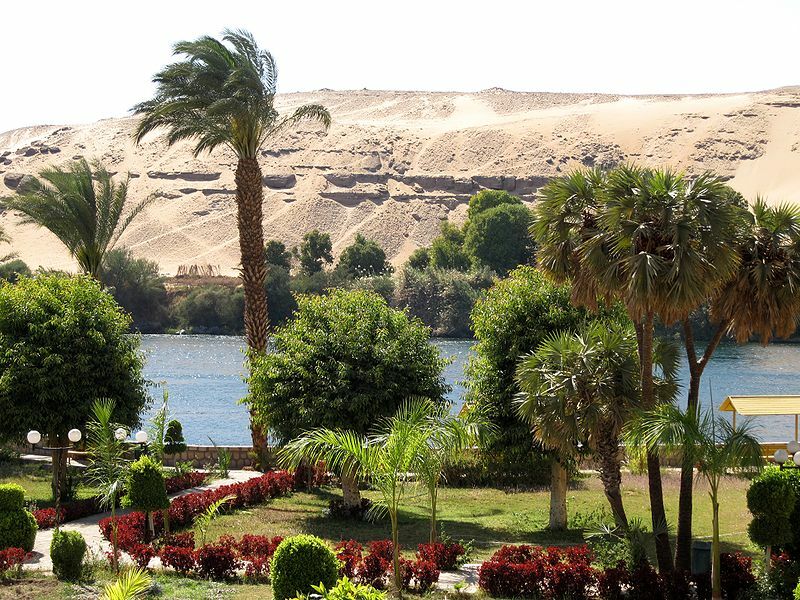 Elephantine Island is, in places, richly overgrown with luxuriant palms. It was the home of two Nubian villages whose inhabitants still preserve their old traditions. 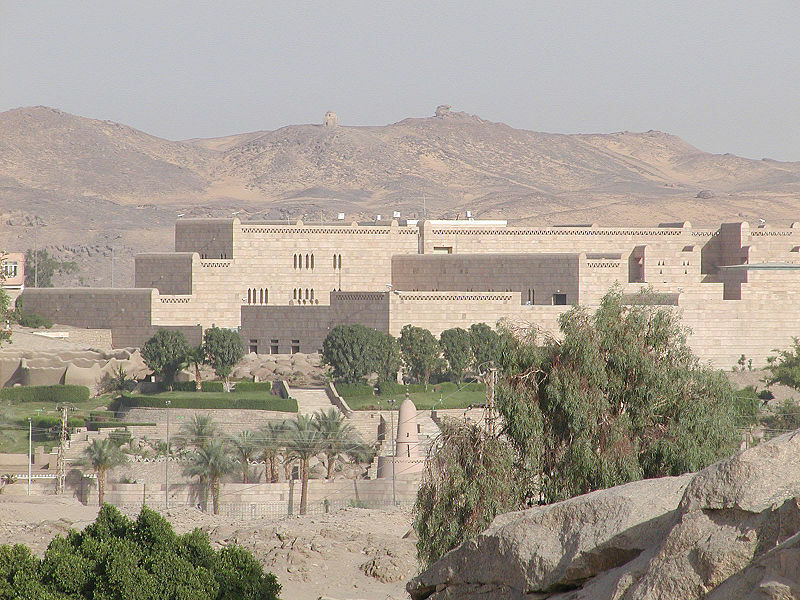 It is also the location of the Aswan Museum. This building, constructed in 1902, was originally the home of the designer of the old dam. A number of objects found during excavations are exhibited here, though the most important ones have been transferred to the newer Nubian Museum. 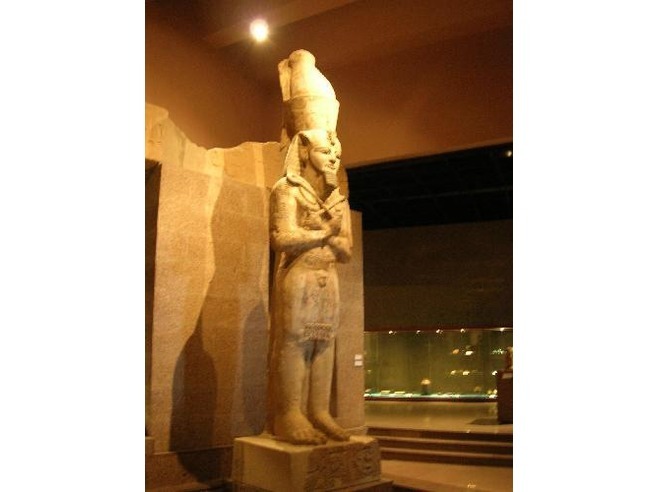 It opened to the public in 1912 and features Nubian artefacts saved during the construction of the Aswan Dam. In 1990 a new extension was added, displaying findings discovered on Elephantine Island itself, like utensils, weapons, pottery and mummies. The museum is close to the Ruins of Abu, where excavations are still taking place. If you take the path through the garden behind the Museum you will reach the site which has been made into an outdoor museum. 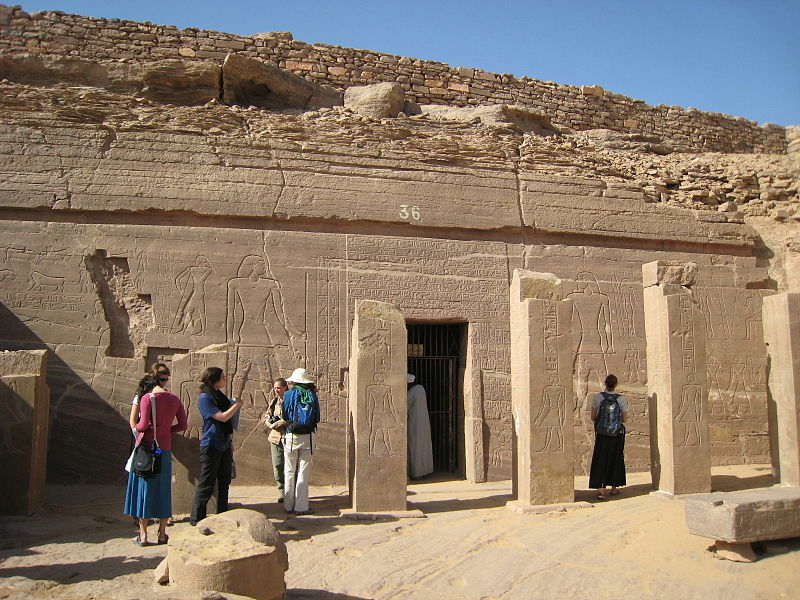 This very tiny little Nubian Museum on Elephantine has gained some popularity through guidebooks such as Lonely Planet. The museum is it the home of Mr Mohamed Sobhi and he and his family will make you welcome, even cooking a meal for you if they know you are coming in advance. The price is dead cheap and Mr Sobhi will meet you if you phone ahead. The little museum is open 8.00am to 7.00pm. This seems to be a rare thing – an authentic experience! Aswan Botanical Garden on Kitchener's Island. Kitchener rapidly transformed the small 750 metres (2,460 ft) long island into a paradise of exotic trees and plants in carefully planned gardens with viewing walkways. It later became the property of the Egyptian government and was used as a research station for examining different food and cash crops. Today a biological research station is located at the southern tip, which is closed to botanical garden visitors. On nearby Kitchener’s Island are the beautiful Aswan Botanical Gardens, a delightful place to take a leisurely stroll. The small island as a whole constitutes a botanical garden containing many types of subtropical, exotic, and rare plantings – a collection begun by Lord Kitchener and expanded since. The island is also home to many birds. The gardens are particularly popular among the local people and tourists as a park for a quiet afternoon away from the noise of the city and weekend picnics. 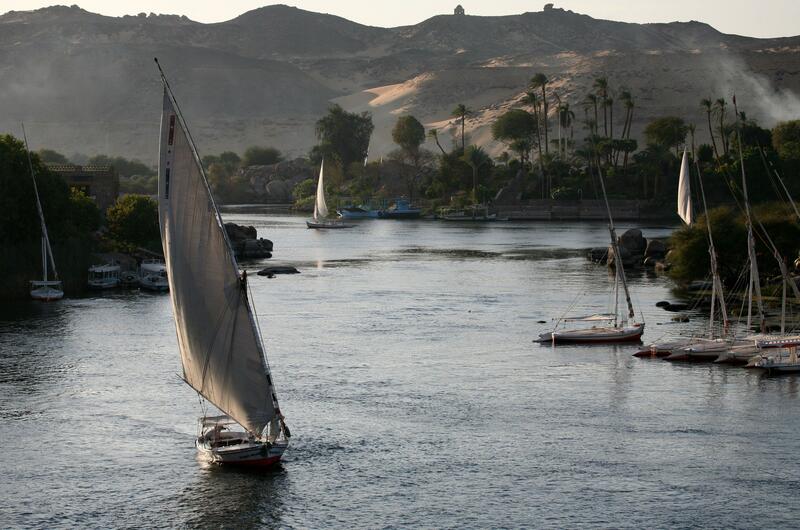 The island and gardens can be reached by felucca, motorboat, or one of local ferries. Standing directly north of Kitchener’s Island on the west bank of the Nile and to the north of Aswan itself, situated on the hill of the tomb of Qubbet al Hawa (or ‘Dome of the Winds’), a Muslim prophet who gives the hill its local name, the Tombs of the Nobles are tombs of important Egyptian individuals. These range from princes and governors (nomarchs), to Elephantine dignitaries and keepers of the Gate of the South. In total, six of the Tombs of the Nobles are actually open for members of the public to explore, dating back as far as the Old Kingdom and including the Tomb of Harkhuf, the Tomb of Hekaib, the Tomb of Sarenput I and the Tomb of Sarenput II. Qubbet el Hawa – Located on the hilltop above the other tombs with stunning views of the Nile. The tombs are accessed through a simple entrance hall, with a corridor leading to the actual burial chamber. Those visiting the Tombs of the Nobles will arrive by ferry and find a stairway close by, leading up the hill from the ferry landing, linking the tombs directly and making them easily accessible. The tombs are beautifully decorated and are artistic treasures of the Old and Middle Kingdoms. The hill is also the site of a Coptic monastery and some of the tombs were reused as a Coptic church. **Note that some locals may hang around the entrance as you climb the hill, and tell you that it’s closed and you need a key. They will show you a key, implying that they can help you gain access…for a small fee. Just tell them, “no thanks….just looking”, and they should leave you alone. About a 30 minute camel ride from the Tombs of the Nobles are the Western Quarries, not often visited and well out into the desert. There is another unfinished obelisk here (of Seti I) which was abandoned when it apparently cracked. This obelisk is carved on three sides of the apex. They say beware of snakes when you head out this way and you will need to take water with you. You will need to bargain for the camel and guide at the ferry landing – up to LE100. Hot, desolate, sandy with snakes – but it will be something that not everyone who visits Aswan has done! Just north of the old Aswan Dam the island which lies in the middle of the First Cataract can be visited by tourists from 7am to 4:00pm. Here you’ll find some friendly Nubian villages, well known for excellent beaded jewellery. The island is also the location of the famous Famine Stela from the reign of King Djoser and there is a cliff with more than 200 inscriptions from the 18th dynasty. The texts of the Stele, arranged vertically, narrate the terrible famine that afflicted the country following the failure of the floods over a period of seven years. Entrance is 65LE. High up in the west bank, the Tomb of the 48th imam of the Islami sect and his wife is viewable from the outside, although closed to the public. 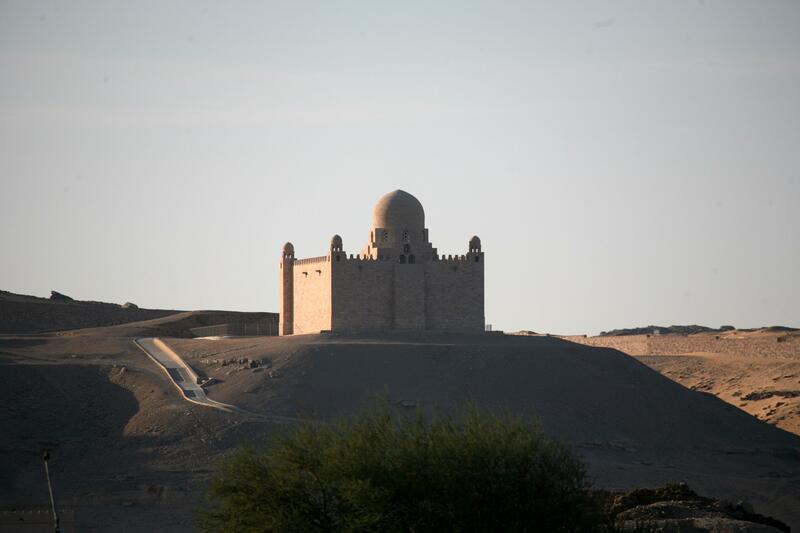 The Mausoleum of the Aga Khan is an important landmark in the Aswan area for many reasons and its beautiful pink granite facade can be seen for miles, being perched atop a small desert hill. The Aga Khan was an exceptionally wealthy Egyptian and lived close by, in a large white villa. Visitors are able to climb the steep pathway and visit the actual tomb of Aga Khan, which is made of white Carrara marble. When his wife was alive, she used to lay a single red rose on his tomb every single day (sometimes flying them in from Paris when they are not available in Egypt) and this romantic practice is still carried out today. Mausoleum of the Aga Khan perched atop a hill on the banks of the Nile. The modern town of Aswan lies on the right bank of the Nile. Known in ancient times as Suenet, it was a key strategic point for controlling the trade to Nubia, to where expeditions set forth in search of gold, ivory, incense and precious woods. These days the bazaars sell spices, craft objects and souvenirs such as dried hibiscus flowers (or carcade/karkade), which makes a delicious and refreshing hot or cold drink popular in Egypt. Perhaps the most charming souq in Egypt this winds along around 2km of the “street of the market”. There is far less pressure to buy than in other cities but times are difficult to desperate for those in the tourist business all over Egypt and it is likely not as laid back as it once was. Buy Nubian talismans, baskets, Sudanese swords, African masks, live produce, food, fruit, vegetables, henna powder, t-shirts, perfume, spices, robes, statues. Aswan is famous for the quality of its peanuts (fuul sudan), henna powder (sold in different qualities) and dried hibiscus flowers, used to make the much-loved local drink karkadeh. Bikes are available at many hotels. For something different, cross the modern bridge to the east bank and bring back your bicycle afterwards by ferry boat. There are many inexpensive restaurants in Aswan where you can eat delicious Egyptian food, enjoy a mint tea and perhaps a shisha. Many of them have quite stunning views over the river. The local fish restaurants near the city market can be excellent — their fish is fresh, and you can watch it cook. Located at the southern end of the Corniche. When you’re in Aswan you’ll have to walk along the Kornish Al Nile (Corniche) at least once. It is a pleasant stroll, made even more pleasant by the fact that you can walk right into the Ferial Gardens at its southern end. They make a park that is as relaxing as it is beautiful. Admission is 5LE. Nubian Museum. The building has three floors for displaying and housing artefacts, in addition to a library and information centre. The largest part of the museum is occupied by the monumental pieces, reflecting phases of the development of the Nubian culture and civilization. This beautiful museum offers visitors a complete panorama of the history and archaeology of the region and much of Nubian culture. It is not only a repository for a collection of important objects from throughout Nubia’s history, and Nubian art and culture, it is also intended to be a hub around which the cultural life of Aswan revolves. The High Dam is made of a massive 42.7 billion cubic metres (17 times the volume of the great pyramid) of stone, sand, clay core and concrete casing, extending 3.83 kms in length and 111 metres in height, 970 metres wide at its base and 40 metres wide at the top. It was built with the help of the Soviets between 1960 and 1971, and was finally inaugurated in January 1971, after eleven years of work. The Dam was financed with income from the nationalised Suez Canal and Soviet financing. Aswan High Dam panorama. The High Dam was constructed between 1960 and 1970. 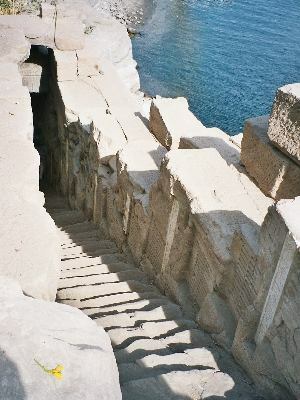 The dam has had a significant impact on the economy and culture of Egypt. The Dam has created an immense reservoir, Lake Nasser, covering an area of 5250 kms (510 km in length and 5 to 35 kms in width), which is the second largest artificial lake in the world. The British actually built the first Aswan Dam at the head of the cataract in 1902 but this finally became too small for the irrigation required. The new Dam not only provides water for irrigation but also generates electrical power for all of Egypt, fulfilling about a quarter of the country’s needs. The dam has profoundly altered not only the economic development and agriculture of Egypt, but also the environment of the entire Nile Valley and the Mediterranean Basin, over 1000 kms away. Despite being such an impressive piece of engineering the dam itself can be somewhat of a let down from the tourist’s point of view. Lotus Tower at the High Dam, the monument to Soviet assistance. Located on the west bank of the River Nile, the Egyptian Russian Friendship Monument is situated close to the High Dam and is hard to miss, being built to commemorate Russia’s involvement when the dam was constructed. Based upon the five petals of an actual lotus flower, this Egyptian Russian Friendship Monument towers more than 70 metres / 230 feet into the air and is set on a hill overlooking the dam wall. An observation deck stands part way up and offers some impressive panoramic vistas across the Dam and beyond. 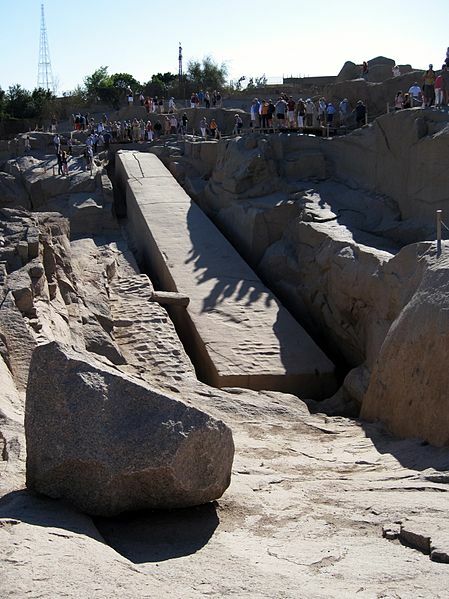 South of the city are important granite quarries where red granite was extracted in Pharaonic times. Still attached to the quarry-bed with its three other sides and apex already carved is an unfinished obelisk, seemingly abandoned when cracked. This graceful granite monument, nearly 24 meters in length, would have weighted 1164 tons if completed and would have been the largest of all Egyptian obelisks. It demonstrates the technique of detaching rock from a quarry by boring holes along prescribed lines, driving wedges into the holes, soaking the wedges with water causing them to expand and thus crack the rock face. About 6km south of Aswan, 30LE; 15LE student. This ancient cemetery is at the southern end of Aswan. The faded former glory of the Fatimid Empire can be seen in the crumbling graveyard. The many tombs, some of which belonged to the Arab governors of the city, were built with unbaked bricks. Elaborate domes and arches are typical elements of the tombs. Admission is free. Sculptors from around the world exhibit their pieces here every spring for the International Sculpture Symposium. The works are all created in Aswan (on the terrace of the Basma Hotel) and when finished brought to this site and exhibited next to each other within view of the ancient quarry. 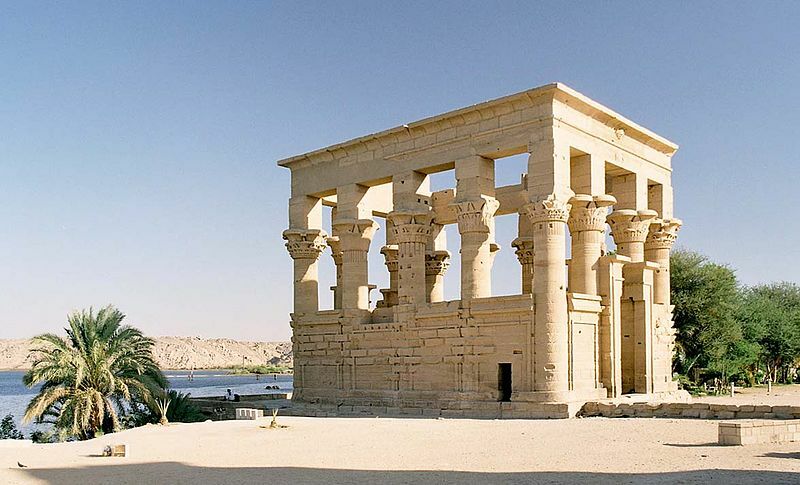 This wonderful group of temples, the most important of which is dedicated to the goddess Isis, started to become flooded after the construction of the first Aswan Dam in 1902. Faced by the threat of complete inundation they were dismantled stone by stone and transported to the nearby island of Agilkia. 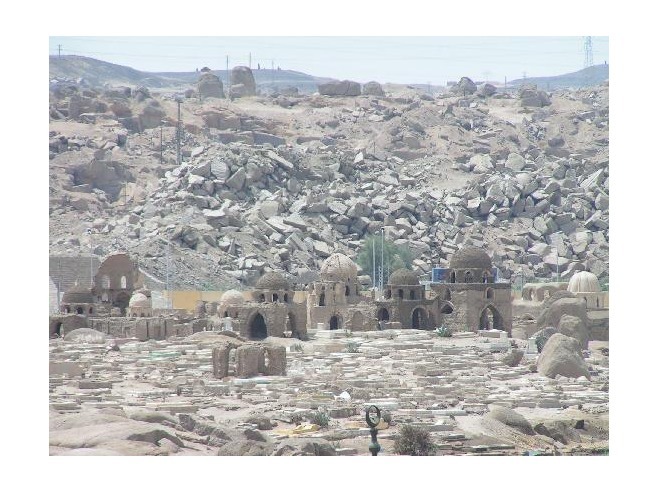 UNESCO mounted a massive eight-year rescue operation between 1962 and 1970 (which also included a number of temples in Nubia) that saw the entire island’s temples being shifted. Originally the temples were built during the final Egyptian dynasties and in Graeco-Roman times. The cult of the goddess Isis was transferred here to be near the island of Biga, where the ancient Egyptians believed Osiris to be buried. The most important is the Temple of Isis which has a birth house, hypostyle hall and sanctuary, the walls of which are decorated with mythological scenes depicting the Ptolemaic kings. The reliefs on the external wall date to Roman times. Note also the re-use of the temple as a Christian church, with crosses carved into the older hieroglyph reliefs, and images of the Egyptian gods carefully defaced. There are graffiti and inscriptions dating from the 1800s, including a memorial inscription for soldiers killed in the Sudan. Outstanding among the other buildings is Trajan’s Kiosk which is formed, basically, by a portico of 14 columns with fine mixed capitals supporting a rough wall. Nicknamed “the pharaoh’s bed” by locals it has no roof (the original was probably made from wood), but its fourteen columns with elaborate composite columns are connected to each other by half walls. Lack of epigraphic evidence means its function cannot be confirmed. 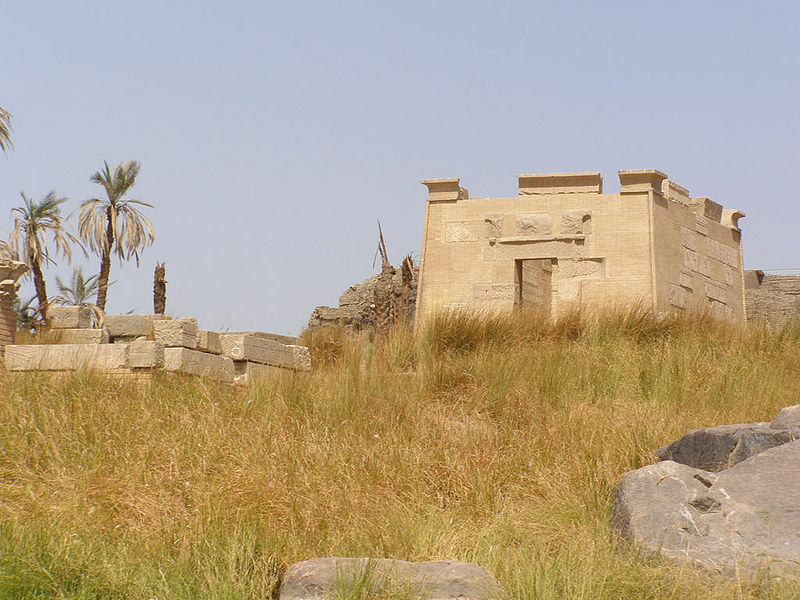 The elegant small building has almost become the symbol of Philae. You can see the submerged original island a short distance away, punctuated by the steel columns used in the moving process. Don’t miss the Sound and Light show at night. Grab a felucca captain and they will sail you across to the camel marshalling area. Ride the camel to the Monastery of St Simeon. The Monastery of St. Simeon at Deir Amba Samaan, dates as far back as the 7th century and survived as a Christian stronghold of southern Egypt until destroyed by Saladin in 1173. While still in use it housed 300 monks, and could in addition receive up to 100 pilgrims at a time. The monastery was surrounded by a 10 metre high wall, and doubled as a fortress. Apparently, the monastery did not return to its original use after Saladin’s destruction. It is amongst the best preserved of all Egypt’s Christian landmarks and strongholds. Surrounded by sweeping expanses of desert sands, the Monastery of St. Simeon boasts some wonderful views and can be reached by boat and then by either camel or donkey. The monastery was enclosed by walls measuring some 10 metres / 33 feet, and is comprised of two floors, with the lower level being constructed of stone, and the upper floor from mud bricks. To get here, ride a camel or walk from the Tombs of the Nobles. Admission: Adult: 25LE, Student: 15LE. El Tabia Mosque reveals the typical architecture of central-dome mosques having an arched entrance, flanked in this case by two minarets, and the prayer hall beneath a central dome. 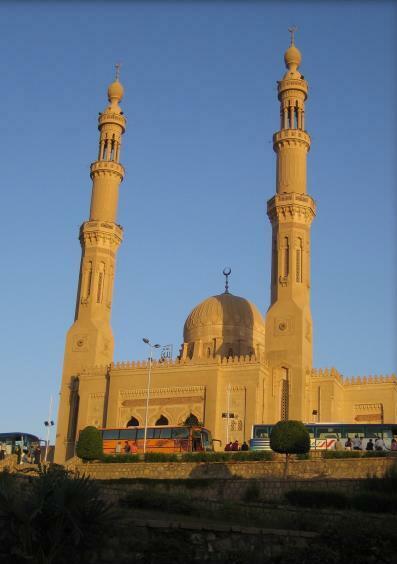 El-Tabia Mosque is surrounded by scenic gardens, being located amidst a park on a hill in the centre of Aswan. Aswan St Michaels Coptic Cathedral. Consecrated at recently as 2006, the cathedral boasts a set of twin towers, some elaborate stone carvings and many huge, arched windows, being topped with a simple white dome. 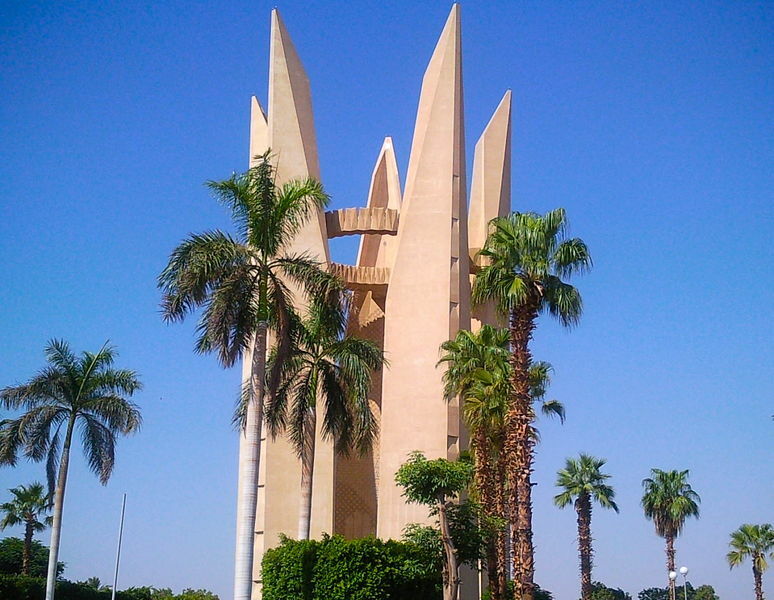 Archangel Michael’s Coptic Orthodox Cathedral is a stunning modern landmark and enjoys a beautiful setting next to the River Nile. 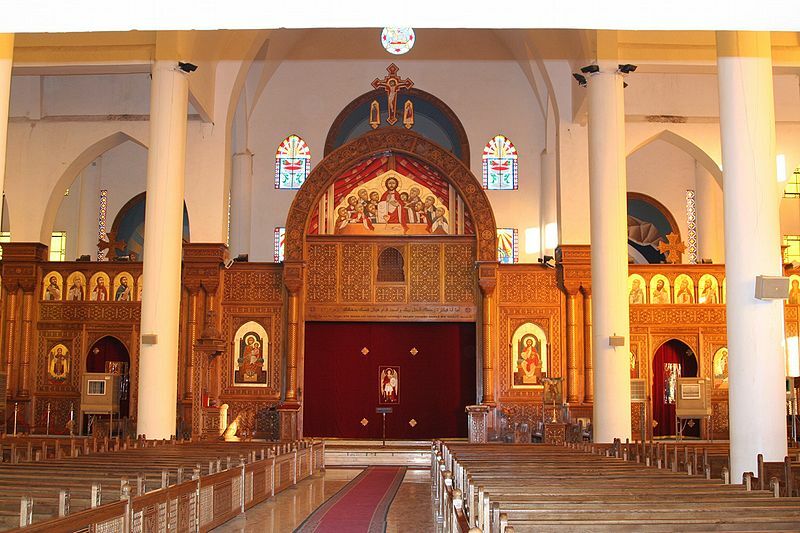 Despite its relative youth, the architecture of the Coptic Orthodox Cathedral is very traditional and once weathered, will no doubt seem quite historical in its appearance. Open daily, entry free. Some 500 kilometres long and an average of 12 kilometres wide, this lake displaced many of Egypt’s Nubian peoples who lost their traditional homes and dispersed across Egypt. Nubian culture can still be experienced by the visitor. Most of these temples can now only be reached by boat. Near the High Dam are the temples of Kalabsha, Kertassi and Beit el Wali. 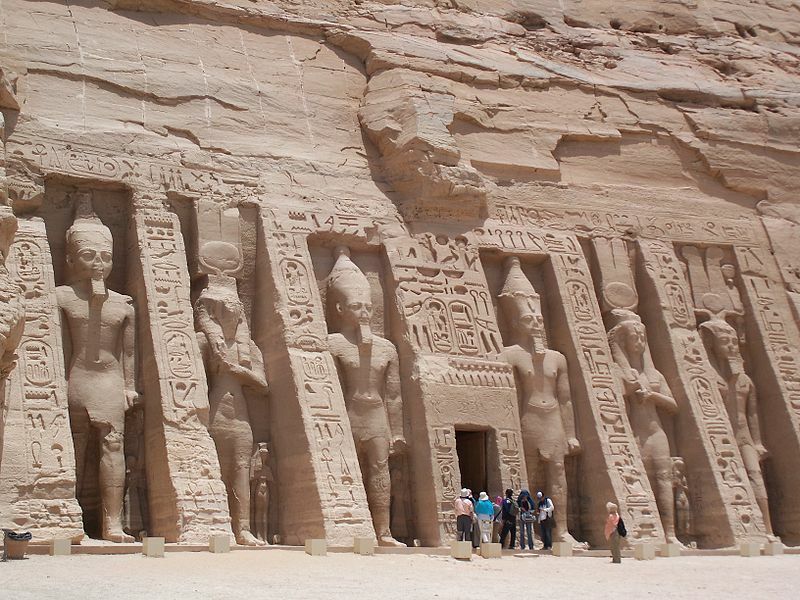 The last, built during the reign of Ramses II, is carved into the rock and the forecourt walls adorned with scenes from the war against the Ethiopians and the Kushites. Like Philae, Kalabsha temple and its surrounding ruins were moved by UNESCO to save them from the floodwaters of Lake Nasser. The main temple was built to the Nubian fertility and sun god Marul during the rule of Emperor Augustus. Don’t miss the Kiosk of Qirtasi and the amazing Temple of Beit al-Wali built by Ramses II. 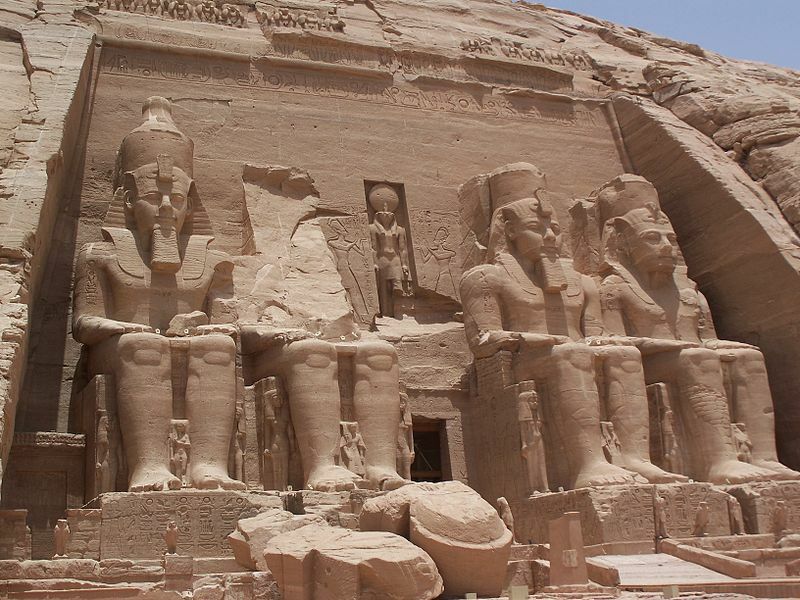 You can take a excursion to these temples from Aswan. 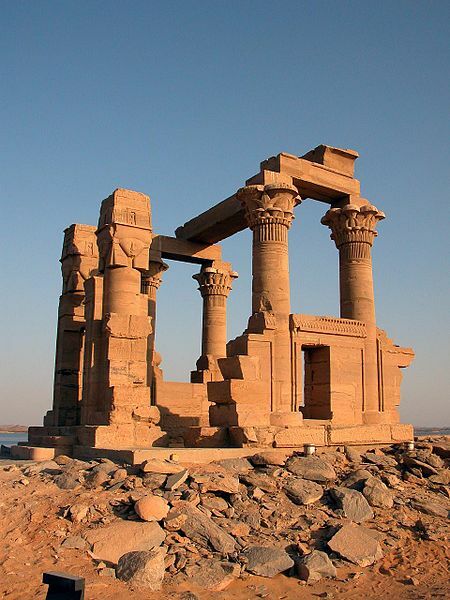 In Lake Nasser, and accessible only by boat cruise, round 140 km south are the temples of Wadi el Sabu, dedicated by Ramses II to Amun and Ra Harakhty, and Dakka and Maharraka, built during Graeco-Roman times. Towards the middle of the lake lies the Amada site made up of two temples and a tomb. The Temple of Amada is one of the most interesting, consecrated by Tutmosis IV and Amenophis II, the remains of many paintings are still conserved here. The temple was converted in to a church by the Coptic Christians. 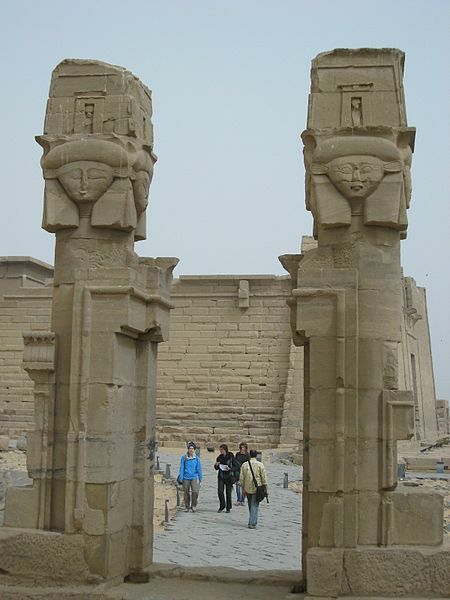 The excavated Temple of Derr was devoted by Ramses II to Amun-Ra. 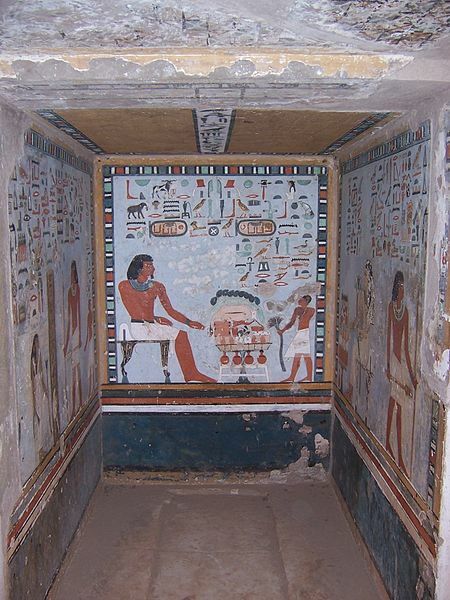 The Tomb of Penut, also excavated, is interesting due to its well-conserved decoration featuring scenes from Penut’s life. The quickest and easiest way to get to Abu Simbel is by air but you can also go by road, although the journey is some 280 kms and vehicles go in convoy so there are set departure times. The two temples cut into the rock here were already well-known before the risky but successful operation by UNESCO saved them from being lost under the rising waters of Lake Nasser. The new site is some 64 metres higher. The Temple of Ramses II is the most important and its façade features four colossal seated statues of the pharaoh which are each 20 metres high. The smaller figures at his feet represent princesses, princes and the favourite wives of this prolific pharaoh, who is said to have fathered over 100 children. The reliefs on the thrones feature figures associated with the lotus flower and papyrus, symbolising the union of Upper and Lower Egypt. In the sanctuary there are four figures cut into the rock representing four important gods – Ptah of Memphis, Amun-Ra of Thebes, the deified Ramses II and Ra-Harakhty of Heliopolis. At the original site, each February 21 and October 21 ONLY, supposedly anniversaries of the coronation and birth of Ramses II, the first rays of the sun would illuminate three of these figures, the exception being Ptah, the god of the Underworld, who never sees the sun. After the transfer of the temple this amazing site continues to occur, but one day later. 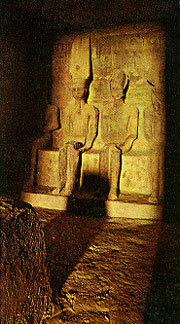 The smaller temple is dedicated to Nefertari, Ramses’ favourite wife who was apparently Nubian, and the goddess Hathor. The façade features great standing sculptures of the pharaoh and Nefetari as Hathor. Beside them are smaller statues of some of their children. Inside is a room with six Hathor pillars, the walls adorned with scenes from the life of Ramses and Nefetari, and religious scenes in which the king and queen are shown accompanied by other divinities. Try to be at Abu Simbel as the sun lights the façade in the early morning. Hello, I like this post, and I have bookmarked it. Thanks for the valuable information.